Melissa Nelson believes the best ways to teach Native American youth about their cultural past is through their hearts and minds, as well as their stomachs. Now she is using traditional and ancient teachings, crops, and food practices as a way of increasing their pride and health, and diminishing their reliance on junk foods. Nelson (College Eight '91, environmental studies), is a Native American activist and scholar traveling the world to educate, inspire, and learn from indigenous cultures. She teaches American Indian studies at San Francisco State University and is the president of the Cultural Conservancy, a Bay Area organization that is involved in indigenous rights and the food justice movement, re-connecting Native Americans with healthy "heritage foods." "We are making sure that these foods and plants are accessible to people who need them," Nelson said. She credits her time at UC Santa Cruz with blending her diverse interests in biology, ecology, and religious studies with her strong interest in social justice. "I found my kin at UC Santa Cruz," said Nelson. After graduation, Nelson explored various nonprofit organizations in the Pacific Northwest, and in 1992 started volunteering for the Cultural Conservancy. She went on to earn a Ph.D. from UC Davis in ecology with an emphasis on Native American studies. In 1993 she became the first Native American executive director at the Cultural Conservancy. Through education and activism, she works hard to inspire and train youth. "Most native youth are living in urban communities and are cut off from their traditional lands," said Nelson. Nelson is working to revive interest in tribal food traditions—and many of her former students, including Trevor Ware, now an intern at the Cultural Conservancy, are taking her lessons to heart. He now grows Native American food and medicine at the College of Marin. His harvest includes heirloom tomatoes, corn, and soap plants, which are being distributed in urban areas in Oakland and San Francisco. "For me, learning how to plant, tend, and harvest these plants is of the utmost importance," Ware said. "When I lived among my people in Oklahoma I saw that the vast majority of them ate whatever Wal-Mart had to offer, or a dollar store, or, even worse, the food at convenience stores in gas stations." 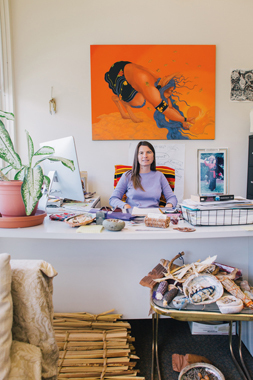 Ware is just one of many students who came to San Francisco State to study American Indian studies and went on to work with cultural revitalization. "Melissa has influenced me in many ways. She has motivated me to be an active participant in revitalizing our cultures, and she really demonstrates how to do this through the numerous projects she is involved in," said Ware. The Cultural Conservancy also teaches traditional native cooking, which blends stories and histories along with lessons in basket weaving, canoe making, and woodwork. Nelson's work in academia is also part of her mission to revive interest in Native American history and culture. When she arrived at the San Francisco State University 13 years ago, she was the only full-time American Indian studies professor. She's helped to rebuild the department to include four other full-time native faculty. Nelson is a regular contributor to academic journals. Her first edited anthology, Original Instructions—Indigenous Teachings for a Sustainable Future (2008), features three of her essays and focuses on the persistence of traditional ecological knowledge in contemporary native communities. She is currently editing a book on traditional ecological knowledge and sustainability, which will be published by Cambridge University Press. In 2005, Nelson was the co-producer of the award-winning documentary film, The Salt Song Trail: Bringing Creation Back Together, and produces other media through the Cultural Conservancy. Nelson has served on the boards of numerous environmental organizations including Earth Island Institute and Bioneers, and her activism and teaching have taken her to Bolivia, Paraguay, Australia, and New Zealand. "I've really worked to integrate my academic and activist work in a reciprocal way," she said.